Kirkham Music Centre – Relaunch Day! Kirkham Music Centre like to invite you and your child to their relaunch day on Monday 29th April at the music center’s new venue Kirkham and Wesham Primary School . Come along for a free trial and you can sign up for only £15 for the Summer term! Our Music Centres are a place where young musicians of all levels of experience can play together in bands and ensembles and sing in choirs on a weekly basis. 4:00 – 4:30pm – New Brass Blasters! A group for children who are currently involved with whole class brass wider opportunitie and a chance to develop skills further. 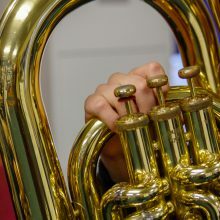 4:30 – 5.00pm – Beginner Band – suitable for brass and woodwind players beginners upwards. 5.00 – 5:30pm – Choir – suitable for all ages and abilities. Lessons also available for brass, guitar, strings and woodwind. Please contact Julie Rayton for more information. We look forward to welcoming you to Kirkham Music Centre! We didn't find any schools matching ''. if your school is not in the Lancashire Music Service area (Lancashire County Council) you may be able to find your school through Charanga Direct. to start your search through Charanga Direct. or, you can call us on 01273 823 909. Find out more about our e-newsletters here.